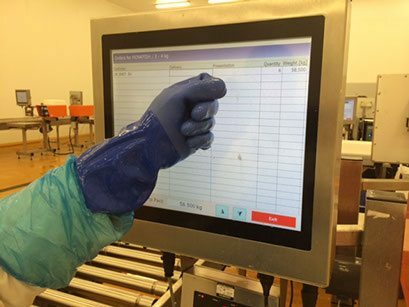 Just like any other industries, the food processing industry has also harsh working environment where an employee has to deal with raw materials and, at the same time, working with touchscreen monitors to ensure that there will be no reason for contamination in the workplace. But, this S17 industrial computer system just perform perfectly without even contaminating the food that are processed during the entire course of processing. The biggest challenge in the food processing sector is its high level of hygienic condition. But, since our S17 Industrial PCs are NEMA-sealed with IP68+ rating, it can withstand such complicated working environment. In addition, it is enclosed in stainless steel panels and protected by tough 4mm polycarbonate filters to handle this kind challenge. Plus, our tracks pad-type keyboards are well-suited leaving no gaps that allow ingress. Of course, you might want to know what makes our industrial computers different from other computer manufacturers’ products. Here’s a quick comparison. Aside from the abovementioned advantages, here are some of the benefits you can get from S17 Industrial Computer System. Energy-efficient. Our industrial PCs use low-powered components whilst providing a processing power that the user to get the job done faster and efficient. It is quite a huge investment. It comes with a built-in Watchdog Timer which control and monitor the entire operations over a wide range of temperature. You need to tie up with the manufacturer for maintenance. Long-term availability. Our S17 industrial PCs have a standard warranty of 3 years but with the option to extend up to 5 years or more. Easy integration. We make sure that our products are easy to integrate to have a lot of built-in features. Compatibility. This kind of technology is powered by Intel with a 2.0 GHz motherboard processor which can store huge amount of data for food processing operations’ purposes. Customisable. This type of industrial product can be customised based on the users’ requirements or needs. Enabled with touchscreen technology with projected capacitance (PCAPs). Whilst our products offer exceptional quality and long-term availability, other PC enclosures may or may not meet your desired specifications. Powered by Intel™ for high computing and performance. The user needs to specify his/her required needs to get the right industrial PC since each of their product have limitations. It is graded IP65 which means resistant from dust and water. The user has no assurance if it can withstand high level of hygienic condition for a long period of time. Analogue resistive panels. Resistive touchscreens are not always quick to respond in terms of touchscreen capability when compared to PCAPs. Good expansion ability. It will cost you more if the user wants to add more features such as expanding the memory space. Cheap. Some of their industrial products have limited endurance as it cannot resist water immersion. Most of our products are patronised by large companies with big names such as Ocean Fish and Systems Integration over the years because of its innumerable features and benefits when compared to other enclosed PCs. So, it is just right to choose our recommended product for food processing operations. We can assure you that the S17 Industrial-grade Computers are your best bet.